Levuka Days of a Parson in Polynesia By C. W. Whonsbon-Aston, London: Society for the Propagation of the Gospel in Foreign Parts, 1937. reported a sea-journey from Levuka to Munia to an British resident on Munia. “Later in the day I was borne over the waters of the huge lagoon within the reef to the island of Munia, where dwells an old Harrovian with his wife and daughters. Here I found that the Koroibo–named after the “gods of the winds”–which was to have taken me further, was up on the beach waiting for timbers, and I became marooned, a modern Robinson Crusoe, under the most ideal circumstances. Description of Munia: The usual Robinsonian requisites were to hand–a beautiful heavily wooded island surrounded with coral reefs full [80/81] of marine life and colour, the big hulk of a yacht (the fastest in these seas) up on the beach, a daily walk around the coast to a far hilltop to look for a sail. The Tui Matefele left a few days later, but I still hoped that I might get along further. At length the same boat returned, but in a leaking condition, needing to be beached again. 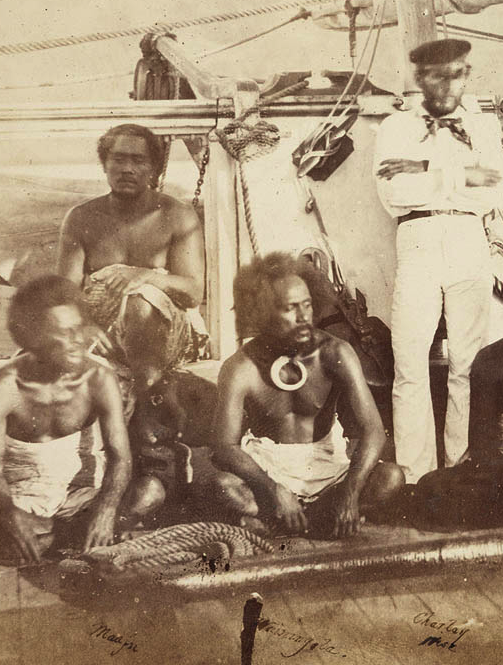 Later, after I had returned to Levuka, she heeled over in a sudden strong breeze, her deck cargo aft went overboard and she simply nose-dived into the deep blue ocean from whence there is no return. Turtle soup for lunch: During my stay some natives from the neighbouring island of Susui came along with a request to catch turtles on the shore reef. In a short time they had captured seven, which were tethered back downwards in the shade on the beach. We had turtle soup and turtle steaks, which are very palatable. Fish was plentiful and fish soup was served in small coconut shells, while a novelty was land crab boiled until the flesh could be broken easily, then baked, with herbs, in their own back shells–very rich. On a nearby island are the huge coconut crabs with tremendously strong nippers that husk the coconuts. • For black strips to be interwoven into a mat, some of the pandanus is taken and buried in the mangrove mud for a time to secure a fast dye. Copra cutting: Each day the bell for the labour to rise rang out at 4 a.m., and men were on their way to work at five o’clock. Each man had his task in copra cutting for the day. This was not a particularly heavy one, for most men were able to do considerably more than their task if they thought fit, and received the extra reward. The bell rang to cease at 9.30, when breakfast of substantial proportions was the order of the day at the plantation homestead; lunch was at one o’clock and dinner at 6.30, just before which the fading daylight gave better reception for the wireless. Radio and wireless connections: Wireless is a great boon to the people of the Pacific, especially in isolated islands such as this. As the darker hours give the best reception and Fiji is in the centre of the Pacific with such a huge expanse of sea from America to Australia, it is possible to hear most of the world’s wireless stations in their particular working hours. Near to six o’clock we would get Los Angeles, where the “Richfield Oil Reporter” used to serve up an extraordinarily good epitome of world’s news. Curiously enough he was speaking, according to his time, late the previous evening. We would then pass on to New Zealand, though Salt Lake City, Chicago, New York, Mexico City and Japan were screaming to talk to us. Then Australia came, two hours behind us, and so on. Temple of Koroibo, “god of the winds”: The island gave plenty of variety. One day we climbed to the summit of its central hill, through the tracks in the dense tropical bush, climbing over the wide, deep trenches that marked the scene of bloodthirsty warfare not many years before. Tropical fruits grew wild along the tracks, as they do in many parts of the islands, and at one stage a quick, bright flash of brilliant red revealed a bush fowl in flight scared by our movements. At the top of the hill are the remnants of the old-time village, hidden there from its enemies at a vantage point from which the movements of rival canoes could be espied. On the peak were the last remains of the Devil temple of Koroibo, “god of the winds”; unfortunately old age and scientists had despoiled it. From the heights we were able to get an excellent view of others of the nearer islands of the group. ‘mystic isle of Mborutu’: As we stood on the beach one day, a particularly clear day when the sea was pale blue and the islands in the distance gave the impression that they were just suspended in the air, I was reminded by my host of the expression used by one of my boys when speaking of the Lau Group: “Away out there it is said by the natives that on the clearest of clear days it is just possible to see the ‘mystic isle of Mborutu’ to which the spirits of the Fijians and Tongans are said to go.” The only island I could see at that time, with my very material gaze, was Katafaga, interesting as being the last island visited by von Luckner before reaching the island of his fate, Wakaya. I was getting anxious, as the weeks seemed to go by and no boat was available to get back to my centre. After a daily searching of the sea we were, at last, rewarded by the sight of a sail which passed by outside the Tongan reef, some miles from us, and turned in to go to Vanua Mbalavu. We despatched a message by boat and found that it was a very small cutter named the Ana which had been away turtle fishing. She had originally been much smaller, but had been cut in half and lengthened, with a hold built forward and a heavy oil engine placed in the cabin portion. The engine having proved useless had been discarded. Thus away we came over the often ruffled Koro Sea, this time kinder to us; slowly, ever so slowly, with the tropical heat striking up on us from the water. We crept into Levuka just after midnight. Whonsbon- Aston’s book , though published in 1937, must tell of earlier trips. The old Harrovian on Munia was Herbert Henry Steinmetz who died in 1936.